Sourdough or sourfaux? Does it go against the grain if your bread is fake? It is hailed as a bread that lasts longer, is easier to digest and has a unique tangy taste. But apparently sourdough can vary hugely depending on where you buy it. According to an investigation by Which? magazine, one in five so-called sourdough loaves sold in supermarkets are not made in the traditional way and contain extra ingredients or additives. But how can you tell a sourdough from a "sourfaux" - and does it even matter? It is made from just three ingredients: flour, water and salt. The dough begins with a "starter culture" - also made with flour and water - which is left to bubble up for several days. It is this which makes the bread rise, instead of adding yeast. "It's bread in its purest form," says Anna Herbert, from family business Hobbs House Bakery, in Chipping Sodbury, Gloucestershire. "A true sourdough should not have yeast in it because the starter sourdough itself rises it." According to a report by the British Baker magazine earlier this year, sourdough is truly an in-demand product with supermarket sales up by 98% in the past year. And it is trendy too, with more than 1.5m Instagram posts tagged with #sourdough. The Real Bread Campaign has called for more research to be done on the benefits of sourdough, but cites some studies which suggests it is more digestible and nutritious than the mass-market loaves of bread found in the bakery aisles. It says the naturally-occurring yeast in sourdough is less concentrated than in commercial baker's yeast and so may be better for people who react badly to excessive yeast in bread. 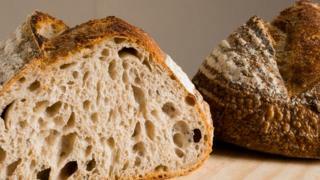 The campaign also cited several studies showing how the glycaemic index of sourdough is lower than other breads, meaning it does not cause spikes in blood sugar. Vanessa Kimbell, a sourdough expert specialising in the digestion and nutrition of bread, says fake sourdough is "very difficult in terms of irritable bowel syndrome and diabetes". "It's absolutely scandalous," she said. "Many diabetics are eating sourdough to control blood sugar levels. Eating fake sourdough can spike sugar levels." Ms Kimbell adds: "I believe manufacturers have a responsibility to define if the sourdough refers to the process or if it's the flavour. "Tell people if it's the flavour." It is clear that supermarket loaves with the sourdough flavour are hugely popular - despite deviating from the traditional recipe. Tesco says it sells around 100,000 sourdough loaves a week and has quadrupled its sourdough range in the last five years. But if you do want your sourdough loaf to be authentic, the Real Bread Campaign has a clear message: always read the label or ask someone in-store. And what does Paul Hollywood do with his sourdough?